Buy the Roto Grip Winner at PerfactAimBowling.com. The Roto Grip Winner continues the brand’s ability to offer value leaders. The HP2 line has been a value leader for some time and this definitely continues that. The Winner uses the new Altered Hotshot™ Core (Symmetric) core inside the VTC-P18™ coverstock. I have to be honest and say we were all wowed by the Roto Grip Winner. It was the surprise favorite in our test session on the house shot. We weren’t totally sure what to expect. We saw some notes from Schlem. We saw some random videos. We never make a decision until we test it ourselves. The formula? A clean but stronger pearl coverstock and a tweaked core to increase the differential substantially from the Show Off series. First ball out of the gate? Length, readable midlane core transition, snap off the dry. It can look skid/flip as it is strong downlane but look closely so you don’t underestimate the midlane transition. It’s more of a core transition than an early cover read. Next ball, flush. Next, flush again. I actually had to try to miss. Maybe I got lucky to immediately found the spot? But the way it went through the pins each time was something I can’t take away. I was able to intentionally miss and it blew through the breakpoint and it was ugly. It helped me find the limits. I compared it to the amazing Marvel Pearl and you could clearly see the rounder less flippy shape. Same overall board coverage but the Winner is definitely more aggressive off the spot. Also compared to the HyRoad and again, the Winner is much more aggressive off the spot and a bit stronger overall than the HyRoad. Use that info to figure out how it would fit in your bag. Sean was next and we usually go on about how he gets on with pearl asyms. Well he got along swimmingly with the Roto Grip Winner as well. It was again the most impressive ball in the test session for him. Was it a coincidence that he went straight to where he thought he needed to be and just started striking? I’m starting to think not. I don’t think this is a simple skid/flip formula. I feel like the cover has some bite in midlane and still tons for downlane. And the core is also clearly designed to have some shape and not just lope and turn over. That adds up to strong flip but heavy roll. It doesn’t have that thin shape you would see from a low end skid/flip intended ball. Sean also compared to the Hyroad. They are pretty close in overall board coverage but the HyRoad is smoother. Moving on to Bryan and we started to realize this is no fluke. The Winner looks great for him straight away. Even though his game is drastically different than Sean’s and my own, he had a great look. He had easy length and that snap gave him good carry. Normal line, the ball goes long on line, has some midlane read and then arcs really hard. Miss out to the dry and it loses midlane but gains it all back at the backend. He also has a Marvel Pearl, imagine that… The Marvel Pearl again has that buttery smooth look with a very different shape to the Winner. Winner is much sharper. While the Winner may look great on the house shot, the Marvel Pearl would be the one he would use to get a more forgiving versatile shape. He also has a HyRoad and the Hyroad is less ball than the Winner for him as it doesn’t react as quickly to the dry from the same trajectory. Finally Dave tests the Winner. As Randy says, “Winner winner, chicken dinner.” Cheesy but what can I say. The ball is clean as you would expect but it has heavy rolling energy retention. He got up there like the rest of us and just struck. In to the oil and it held nicely while still continuing which many times you don’t see on walled up house shots. Tickle the dry and it drives. Go further into the dry and it drives harder. So far we’ve gushed at what we saw with the Winner on the house shot. On Red Square, it didn’t fare as well. Short version, the ball is too snappy on a pattern that is flat and already gives you backend. It was just way too strong down lane from where I was making the shot work. However, it somewhat surprised me as it made the shot in the track with a wide breakpoint playable. No other ball played 15 out to 5 and came back the way this one did. I doubt that would be something I would want to do as it’s not as forgiving. But Red Square is not very forgiving anyway. Sean didn’t have much difficulty making it work. The shot is pretty fresh and he’s learned how to take advantage of balls that have hard change of direction. Bryan was next and as we expected, it’s complete over/under for him as it was for me. Struggled to find something as this motion is simply not the right one for this pattern. Finally Dave and his over/under wasn’t as pronounced. It looked more incremental as he has less side rotation to balance the effect of the big down lane motion the Winner is capable of. 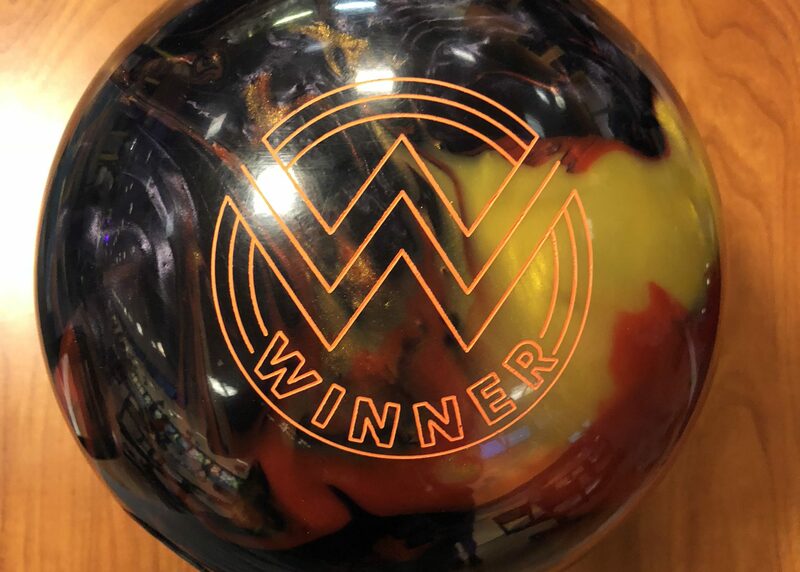 With the Roto Grip Winner, every single tester had an extremely easy time, not only getting to the pocket, but going through the pins nicely. We could have easily strung a perfect game between us with no editing. This is definitely a rarity in our almost 10 year experience of testing. It’s always hard to tell how any ball will pan out over time but a very positive start never hurt anyone. Honestly, this is a lot of ball for HP2. I kind of expected a what I call “thinner” reaction shape. Thinner meaning the ball almost feels like 2 phases without much useful midlane. The All Out Show Off was definitely thinner than the Winner. You have balls like the Loco that are fantastic even “thinner” shaped balls where you want skid and backend because you use it when you don’t want any real midlane read. The Winner does react quickly to friction but we do think it needs to see some friction. There is certainly the possibility of over/under with a ball this aggressive off the dry that needs to see dry which is a hallmark of the proverbial “thinner” ball. It just didn’t seem as sensitive as we thought it might which makes it a huge bang for the buck in the HP2 line. This ball almost feels like how the SonIQ should have felt. SonIQ in OOB was clean, made what looked like an aggressive turn but had somewhat of an inconsistent pocket entry on this same house pattern. This ball feels like the same shape but a bit sharper leading to strong consistent pocket entry. In the end, this seems like cheap entry into what really is a fine mid-level ball. This shape lends to great carry on house shots. Will not use a cliche here but I guess it’s called the Winner for a reason.